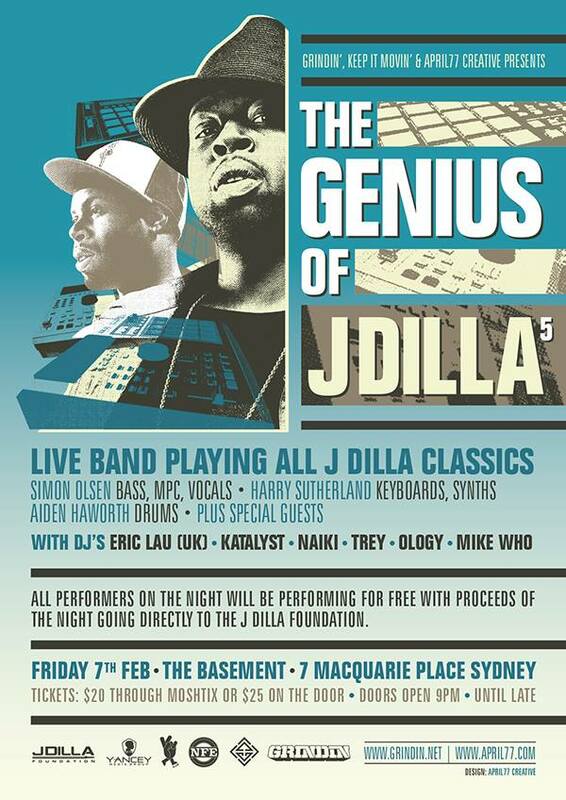 Fundraiser: The Genius of J Dilla Tribute feat. Eric Lau (UK) feat. Hau (Koolism), Kween G (Killa Queenz), Rob Edwards (The Voice), Katalyst & More | SOUL OF SYDNEY FEEL-GOOD FUNK SOUL DISCO vibes & beyond. Live band featuring MC’s & vocalists playing J Dilla classics for 90 minutes!! For the 5th annual installment commemorating the anniversary of his untimely death and what would have been his 40th birthday this year, Grindin’, Keep It Movin’ and April77 Creative celebrate the music of J Dilla with some of Sydney’s greatest talents. The incredible line-up of musicians, MC’s, vocalists & DJ’s will be paying homage to the man who shaped a new sound for Hip Hop that inspired beat smiths, MCs and music lovers around the globe. British DJ & producer Eric Lau will also be spinning at Sydney’s iconic venue, The Basement!